+ 8 = sixteen Required Please enter the correct value. Silver Price Forecast this Week: Silver speculators are mounting their short positions, meaning that silver prices are likely to continue to struggle in the near term. But investors who hold silver through this short-term weakness are soon to be rewarded for their patience. As it stands, speculators have out about 21,600 short contracts on the white metal representing 108 million ounces of physical silver, a 19.2% increase from the week before, according to data from the U.S. Commodity Futures Trading Commission. It's also a 71.2% increase from two weeks ago when short contracts were at their lowest levels on the year. This means that silver is currently in a cycle of growing short positions, which suggests that at least for a little while, silver investors are going to have to absorb some losses before there are any advances. Also working against silver in the last week is that there was no rise in the number of speculators going long, providing no support for price growth in the face of increasing shorts. Typically, silver – like gold – will move on negative economic conditions. Recently, turmoil across the globe in places like the Gaza Strip, or on the Ukrainian-Russian border, has to some extent provided a safe haven for investors looking to move away from the dollar and equities this year. But macroeconomic events alone are a difficult indicator of silver price movements, as the small size of the silver market creates high levels of volatility. So while a spike in investor interest can help silver make quick dramatic advances, it can also just as quickly have its gains erased when investors pull back. A good recent example of this was last month, over concerns of the Portuguese banking sector. Silver soared when Portugal's second-largest lender, Banco Espírito Santo SA, revealed on July 10 that its retail clients were holding the commercial paper of its parent company, a company that had just two days earlier announced that it was going to miss payments on those debt obligations. Panic ensued and silver jumped 1.5% on the day and peaked at three-month highs of $21.47 an ounce. But over the following weekend, it became clear to markets that those events were fairly isolated, and that only the Portuguese bank was going to suffer, not the Eurozone as a whole. Silver investors pulled back. On Monday, silver saw a 2.5% decline, erasing the previous week's gains. 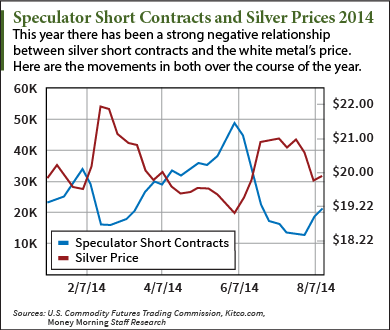 Speculation, however, has been a fairly consistent silver price predictor in 2014.